The life of the absolute majority of representatives of modern society is almost impossible to imagine without a smartphone or, at worst, a mobile phone. Such an innovative gadget like the iPhone allows you to keep on hand a powerful tool for all occasions. If for some reason it was lost, then it is easy to imagine what a blow it would be for its owner. You can find a mobile device using Apple's object service, iCloud. What it is, how it is configured on various gadgets and how the search is performed, will be discussed further. It's no secret that almost any iPhone is a flagship not only for Apple, but also for the industry as a whole. This makes it desirable for both potential owners and intruders. A significant role in this situation is played by the functionality and cost of the device. Therefore, the company's engineers, who have always been distinguished by non-standard solutions that go beyond the generally accepted ones, implemented the search capability in their offspring. The iOS operating system has a regular Find iPhone application that allows you to track the location of the gadget through satellite search system. It is pre-installed by default, but not activated. The first thing that the manufacturer recommends to do after buying a new iPhone, iPad or MacBook is to launch and configure the search function. This feature was first launched on iOS 5, but currently works on all current versions. Moreover, there is a whole search cloud service - iCloud, so to speak, the Apple chip, which functions on iPhone, iPad, and Mac. The destruction of all personal data of the owner of the gadget (they can, if necessary, be restored via the cloud server). Application launch is possible in any browser on any platform (PC, laptop, tablet, smartphone). Before you begin, you need to synchronize the gadget and cloud service, as well as configure the program. How to enable tracking mode? In their operating systems, Apple has implemented a device search mode since version 5.0. You can enable the “Find iPhone” geolocation function in the “Settings” menu and in the “Privacy” submenu. After that, in the settings of the smartphone, you will need to find and select the iCloud tab and activate the device search button in it. It's not a secret that the iPhone is a bad helper in terms of self-service, but if by coincidence it falls into the hands of a knowledgeable person, then it will not be difficult for him to disable the “Find iPhone” function. In this case, it is proposed to insure and secure the gadget, or rather the search service, with an individual password. Starting with iOS 7.0, the company's engineers implemented an interesting feature “Activation lock”. Her role is to completely block the gadget that was attached to the profile on the AppleID activation servers. In this case, unlock and jailbreak smartphone will be powerless to solve the problem. Reactivate an iPhone or other gadget under iOS control. Also, you need to remember that the password to the iCloud service can not be lost or forgotten in any case, because it cannot be restored even through the support service, and it is not possible to use the iPhone without it. There is, of course, a recovery option through the mail service to which the account is attached, but it also does not always work. How to organize the search process? How to connect the function "Find iPhone" is clear in principle, but how to act if the smartphone is still lost / stolen, you need to figure it out. It is logical to assume that the search process itself will be carried out on any other gadget, for example, a personal computer or laptop, with which the mobile gadget is synchronized via the iCloud service. The first thing you need to do is to go to the cloud service site, the authorization on which is based on the login and password of the Apple ID account. After that, the “Find iPhone” icon is selected among the available applications, and the “My devices” item in the menu. Then you should choose the one that was lost from the list of connected and synchronized gadgets. On the map that appears on the screen, the location of the device will be displayed at the time of its last connection to the Internet or current, if there is a connection. In the first case, the service can also inform the owner of the iPhone about the location of the gadget, if suddenly someone connected through it to the Internet. The notification will come to the registered email. In the case when there is no PC at hand, you can use any mobile phone that can connect to the Internet. The procedure is identical to the previous one. Sound alarm. The situation when the iPhone was lost in a house or apartment, the service will not be able to specify the exact location. For such cases, you can use the function of sound. If the gadget is connected to the Internet, then a request will come to it and a loud beep will be activated. Device lock. Using the capabilities of the “Find iPhone” application, you can block a lost or stolen gadget. Such actions will make it completely useless to an attacker. Attempts to resolve the issue through flashing, restoring, rebooting will not give anything. In the iCloud menu you need to select the “Lost Mode” tab. Further actions will depend on whether the iPhone is connected to the network at the moment or not. In the first case, it will be possible to send a notification with a request to call back, and in the second - to set a lock code known only to the owner. Delete personal data. If the iPhone contains confidential data that should not fall into the hands of others, then they can be erased using the capabilities of iCloud. To do this, select the appropriate tab in the device menu and confirm your choice. This can be done both on an active, online device and on an offline gadget. In the second case, the procedure for self-destruction of data is activated only after an attempt to connect to the Internet. It should be remembered that deleting personal data from an Apple smartphone does not mean their final loss - everything can be recovered from the cloud server, if of course they were pre-flooded there as part of synchronization. 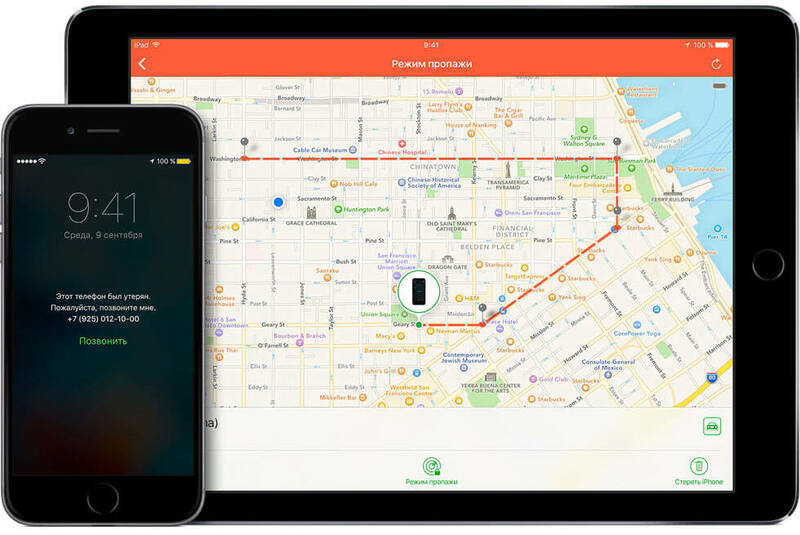 However, such a procedure will make it impossible to track a smartphone by geolocation systems within the framework of the “Find iPhone” function through the iCloud service.